The timeline shows Google's quarterly revenues as of the fourth quarter of 2018. 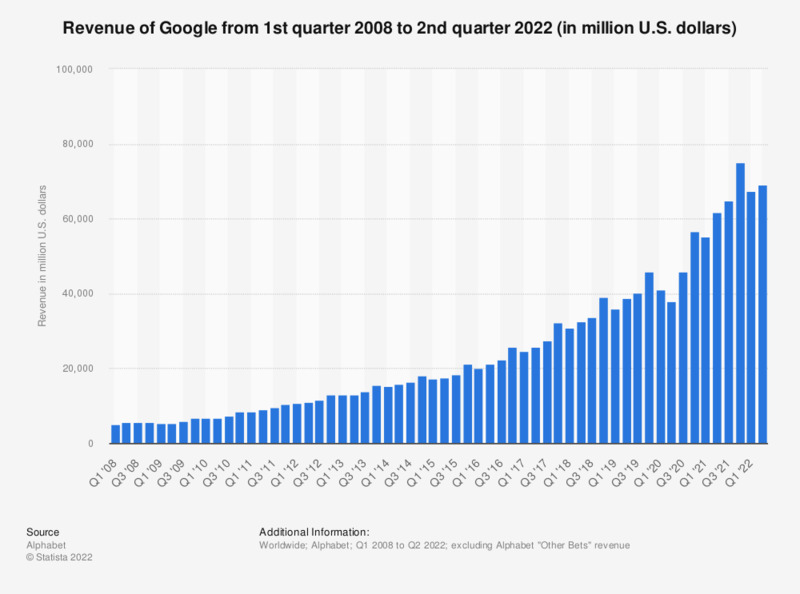 In the most recently reported period, Google's revenue amounted to 39.12 billion U.S. dollars, up from 33.6 billion U.S. dollars in the preceding quarter. Google's main revenue source is advertising through Google sites and its network. The majority of Google’s revenue comes from advertising through Google owned and operated properties such as Google Search, Google Maps and more. In 2018, Google accounted for the majority of parent company Alphabet's revenues with 136 billion U.S. dollars in Google website revenues alone. In 2016, over 70.7 percent of its revenue was generated on Google’s Sites, while around 14.7 percent came from advertising on Google’s network member’s websites and the remaining 14.6 percent came from licensing and other revenues. The revenues generated from Google’s network member’ websites include revenue from ads served through advertising programs such as AdSense for AdSearch for example. Other revenue include digital content products and apps sold through Google’s Play digital content distribution platform, as well as hardware include Chromecast devices and smartphones. Digital content platform Google Play is an increasingly important contributor to Google’s bottom line, especially as smartphones sales and Google’s Android platform’s global market share increase. Geographically, the biggest single country share of Google’s revenue comes from the United States, but 44 percent of revenue come from the rest of the world and 9 percent from the United Kingdom. Values regarding Q4 '14 and onwards have been adjusted retroactively to reflect Google segment revenue of Alphabet Inc. instead of Google's total company revenue as prior to restructuring. Revenue segment title in financial report: "Google segment revenues"